In the Buying guide: Microphones for speech recognition article I wrote last December, I left out one type of microphone: handheld mics. Philips recently released Mac OS X software for their SpeechMike Pro LFH3200 handheld microphone allowing it to be used with Macs and with Nuance's Dragon Dictate ( ), but not with Dragon Express ( ). The SpeechMike Pro is a descendant of the earliest dictaphones: it is a handheld microphone that offers a number of buttons to control dictation. Unlike other microphones, this type of device requires that you maintain your hand in an appropriate position. While there's a certain amount of wiggle room, you should try and keep the mike about 4 to 6 inches from your mouth. Depending on the noise around you, you may be able to hold it further or closer to your mouth. With the SpeechMike Pro at the appropriate distance, its accuracy is excellent, and among the best of the many microphones I have tested. While the need to hold something in your hand may be seen as a constraint, it can actually be very helpful in certain situations. For example, if you are doing research, moving back and forth among books and computer screens, being able to hold this mike always in front of your mouth is practical. While a headset would offer the same position, the SpeechMike Pro has a number of buttons allowing you to control dictation, giving you more than just a microphone. The most useful button is the one that toggles the microphone in Dragon Dictate—if you dictate, you know how useful this is. You may be dictating, then someone comes into your office. If you don't turn off the microphone input, when you've finished your conversation and look at your screen, you'll see several paragraphs of text that the mic picked up. Other buttons on the SpeechMike Pro let you move back one word at a time in your text, and select one word, then extend the selection by one word for each press; this is useful to edit and correct dictated text. Other buttons include two mouse buttons and a tiny trackball. This trackball is, however, difficult to use and imprecise; I would only when I have no other choice. You can also program some of the other buttons, such as F1, F2, and F3. 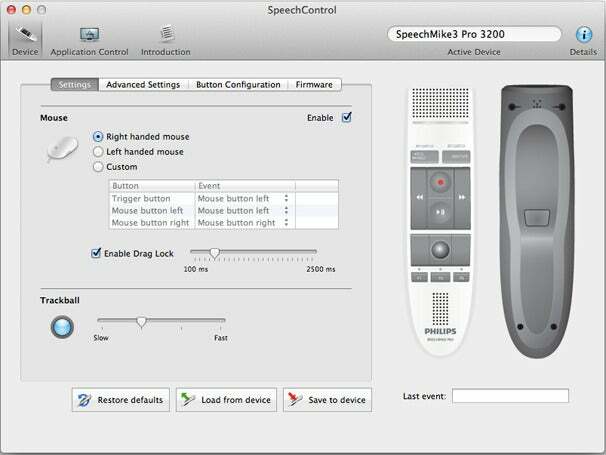 The SpeechControl software lets you assign specific functions to these and other buttons. One practical usage for a button (I use F1) is to use it to cycle through the different speech modes in Dragon Dictate: dictation mode, command mode, spelling mode, and numbers mode. Unfortunately, you are somewhat limited in which commands you can use, since Dragon Dictate is generally not the frontmost program running on your Mac (unless you are dictating into its Note Pad), so only certain commands can be programmed. It's worth noting that these buttons only work if you launch the SpeechControl software when you are dictating. There is no background process with a driver that allows this microphone to control Dragon Dictate if the software is not active. Also, the user's manual for the device does not explain how to use the Mac software; Philips has a "workbook" covering the Mac version of their SpeechControl software available for download. 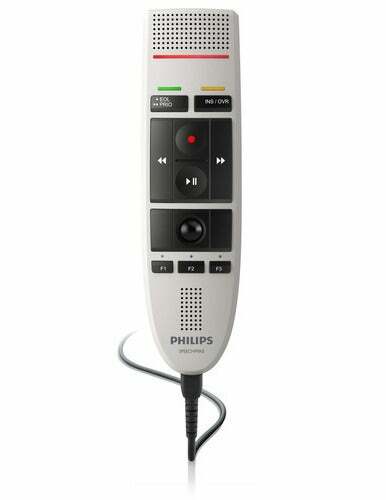 The SpeechControl software lets you adjust a number of settings for the SpeechMike's buttons. The SpeechMike Pro seems a bit more sensitive to being in the appropriate position than other mics I have tested. This microphone is indeed designed to be held in your hand, and, as such, assumes that the distance between your mouth and your hand—hence the microphone—is relatively constant. If you are used to dictating while holding a hand-held device, you probably become familiar with having the appropriate distance between the microphone in your mouth. If you're not used to dictating while holding a recorder in your hand, you may find this uncomfortable. Whether or not you will like the SpeechMike Pro LFH3200 depends on how you dictate, how often you're interrupted (this is where the on/off button comes in handy), and how comfortable you are with a handheld mic. If you do like dictating in this manner, the ability to control Dragon Dictate from the microphone is a plus, and can make dictation a bit easier than with other mics. The accuracy of this microphone makes it an excellent choice for anyone using speech recognition frequently.